Located on the beautiful Lake of Bays, the Port Cunnington Resort offers a variety of chalets, suites, and cottages that range in size. Experience a fine dining experience with a view of the lake for breakfast, lunch, or dinner! Guests can choose from a variety of activities such as golfing, canoeing, playing tennis or relaxing by the lake. As the resort is located only minutes away from the Algonquin Park, a fall getaway would be a perfect time for a day hike. Take advantage of their fall mid-week special for a discounted rate on lodging. Boasting all the amenities one would want at a luxurious lakeside resort, Pine Vista Resort offers fully equipped cottages on Stoney Lake at an affordable price for the entire family. This resort also offers a variety of weekend packages in the fall, which includes a Thanksgiving Weekend and Fishing & Touring package. Enjoy a traditional wagon ride, pumpkin carving, apple cider and campfires, or choose from one of the many activities offered such as kayaking and canoeing to hiking and biking. If relaxing is your goal, check out the indoor hot tub and various recreation equipment or take a stroll with your camera to capture it all. Stoney Lake Ontario – Canada the view from Pine Vista Resort إطلالة منتجع Pine Vista على بحيرة ستوني أونتاريو – كندا بمشاركة @dianajammal . #little_tourists #tourists #stoneylake #ontario #canada #pinevistaresort #trip #travel #travelling #tour #lake #pinevista #المسافرون_العرب #سياحةوسفر #زاد_المسافر #العرب_المسافرون #زادالمسافر #رحلة #سياحة_العرب #سياحة #سفر #كندا #أونتاريو #بحيرة #بحيرة_ستوني #منتجع # . Combining a love for the beautiful colours of leaves during the fall and hikes, the Deerhurst Resort offers a special fall package which includes accommodation, complimentary snacks for each person and a free day-use park permit to the Algonquin Park. The resort has a fun-filled fall activity guide which includes indoor and outdoor adventures as well as dining and entertainment options. Check out the fall trail rides available at Stoneleigh Farms located at the resort. For those looking for a relaxing stay filled with golfing and spa treatments, the Deerhurst Resort also offers a discounted fall rate for mid-week stays. The Fern Resort, located in Orillia, Ontario, offers a fall Thanksgiving package that can be enjoyed by the whole family. Start the day with a family pumpkin carving contest and show off your talents and be eligible to win one of the contest categories. Continue the fall fun by baking an apple pie with fresh picked apples and participating in a pumpkin launch. End it off with a cruise on Lake Couchiching to embrace the colours of fall and hot apple cider. For a complete list of Thanksgiving activities be sure to check out their site! The fall season provides an even more enjoyable time at the Westin Blue Mountain. A fall getaway at this hotel includes a tasting tour of grapes, apples, and hops! By that we mean, a tour of the Georgian Hills Vineyards, Thornbury Cidery, and Northwinds Brewery for lunch. Interested in something more family friendly? The Westin at Blue Mountain also offers an exclusive package to experience the largest apple growing region of Ontario, otherwise known as the Apple Pie Trail. Free family activities and live music are provided during the Apple Harvest Festival and an annual Halloween Hill Haunt transforms Blue Mountain into the Haunted Hill. Forget camping! With the cooler weather approaching, sometimes the best way to spend your fall days is a dockside getaway with a luxury twist. The Muskokan is a resort club that offers beautiful views combined with on-site amenities and access to full-time service staff. Each villa and cottage is located on the waterfront of Lake Joseph, allowing for private relaxation. For those wanting to stay more active, a pool and tennis courts are available, as are various hikes in the area. The Muskokan will give you a true cottage experience. This Niagara Falls resort is a perfect fall getaway location for people needing some R&R. The changing autumn leaves provides a stellar backdrop for seeing the Niagara Falls. Experience Niagara-on-the-Lake, Canada’s #1 food and wine destination, by touring local wineries such as Jackson Triggs and Pellar Estates. Complete your fall getaway by playing on one of Niagara’s challenging golf courses or by making some time for yourself and booking a spa treatment or package. This is one getaway that you will be sure to keep coming back to! 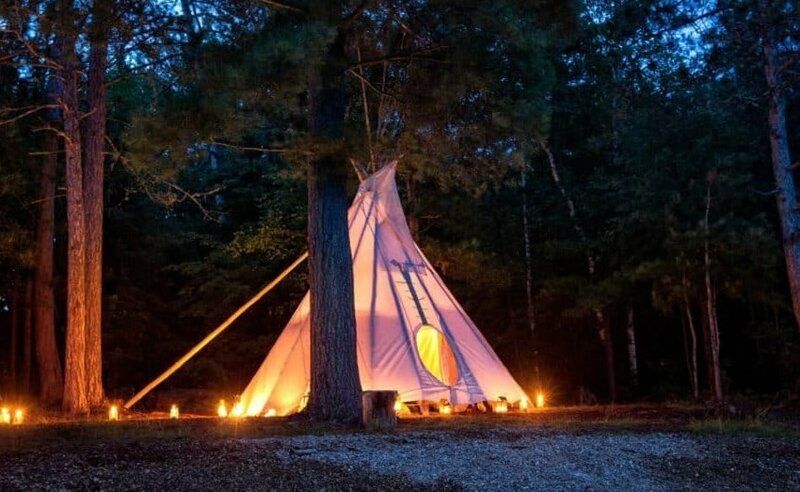 Conveniently located outside of Toronto, Ontario, the White Pines Ancient Forest is campground to Hidden Luxury Tents, a perfect fall getaway for those with an affinity for city living but want a taste of the outdoors. A glamping experience is the combination of camping and glam (or luxury) living – offering modern, yet cozy, comforts in the great outdoors. It is perfect for exploring unspoiled wilderness and fall forests without the hassle of pitching your own tent. Additional bonus: your stay includes a private chef who serves the finest Canadian dishes. Fall weather and Muskoka are just two things that go hand in hand. The Severn Lodge is a premier lakeside resort, perfect for a fall getaway with the family. Located on Muskoka Lake, it offers an all-inclusive list of activities such as horseback riding, golfing, tennis, games rooms and more. For this Thanksgiving weekend, kids and teens are offered a special rate of up to 50% off. This getaway includes activities for people of all ages, geared specifically for the fall season. Enjoy pumpkin carving, hay rides, a traditional turkey buffet and more. A quick mental recharge may be what you are looking for this fall. The Viamede Resort offers a one-night escape from the city, conveniently located at Stoney Lake, less than a 90-minute drive from the Greater Toronto Area. The Viamede Resort has plenty of amenities to make your stay as pleasing as possible, including a heated indoor pool and their full recreation program. The best part? A 7-course meal with wine pairings at the Mount Julian restaurant that is sure to re-energize you beyond your stay. Nestled in the Haliburton Highlands, on Mountain Lake, the Ogopogo Resort is a family friendly one that offers a memorable environment for your fall getaway. Take a break from your day-to-day life and enjoy the idyllic scenery by fishing Mountain Lake for trout, accessing the Minden White Water Preserve, or hiking one of the many trails surrounding the resort. When you’ve had enough of the outdoors, go inside for a spa or esthetic treatment to help you unwind. The fall season is also known for the Artist’s Studio Tour and Hike Haliburton Festival. Fall weather doesn’t only have to be enjoyed by hiking outdoors – simply changing your scenery can do you a world of good. Take a fall escape to Grafton, Ontario, where the Ste. Anne’s spa October Harvest Getaway will leave you feeling fresh. This getaway includes a cottage-style accommodation, a package of pumpkin flavoured goodies, all meals and unlimited non-alcoholic drinks, and the Pumpkin Spice Paradise seasonal spa treatment (plus more!). During your stay, be sure to explore the beautiful countryside which will have the most vibrant fall colours displayed in October! With offerings of cozy waterfront accommodations, fine dining, entertainment and adventurous recreational activities, the Bayview Wildwood Resort is a top destination for you fall getaway. With your binoculars and camera in hand, take a bike ride or hike a trail and experience the wilderness of the Canadian Shield in a way you never have before. Then, sit back and relax on a boat cruise along the waters of Sparrow Lake. Bayview Wildwood Resort also offers special activities and rates for the Thanksgiving Weekend, with lower rates extending throughout the fall. In the heart of the Hastings Highlands, the Footprints Resort is a fall getaway destination that is for adults only. The resort sits on a private lake, ensuring a pristine and natural environment with maximum emphasis on relaxing. Recreational activities include a hot tub, the use of non-motorized vehicles on the lake, campfires and barbeques, and musical instruments. Lounge in one of the deckchairs by the lake or float in a daybed. It is a perfect setting for both couples and adult friends to enjoy. Throughout the fall season, be sure to take advantage of discounted rates of up to 70% off. The Scandinave Spa is a relaxing escape located in the heart of Blue Mountain. This resort maintains a quiet atmosphere that allows guests to fully disconnect from the noise and stress of daily life. The Scandinave Spa features Scandinavian baths and hydrotherapy which are well-known for their relaxing, yet invigorating, effects – combine this with the changing colours of leaves in your surroundings and you are bound to be in bliss. The Scandinave Spa offers an incredible fall getaway package that includes a one-night accommodation, 60-minute Swedish massage and access to the baths, and various vouchers that can be used in the vicinity of the Blue Mountain Resort. Take a Fun Fall Colours Train Trip like Algoma Canyon Train or Go on a Cruise on Ontario Waterways. ** – Arranged in no particular order.